Do you endure unexplained headaches or migraines? What about difficulty falling asleep? Do you react badly to mosquito bites? Do you experience irregular periods? If you said yes to any of these questions, then you could have a histamine intolerance. Histamine is a chemical associated with your immune, digestive, and central nervous systems. As a neurotransmitter, it conveys important messages from your body to your brain. It is also an ingredient of stomach acid that helps you digest food in your stomach. You might be most intimate with histamine as it associates with the immune system. If you’ve endured seasonal allergies or food allergies, you may have noticed that antihistamine medications such as Zyrtec, Allegra or Benedryl provide quick relief of your symptoms. This process occurs because histamine’s role in the body is to cause an immediate inflammatory response. It serves as a warning to your immune system, of any potential threats. Histamine causes your blood vessels to widen, or dilate so that your white blood cells can quickly find and attack an infection. The histamine accumulation is what gives you a headache and leaves you feeling flushed, itchy and miserable. This process is part of the body’s natural immune response, but if you don’t break down histamine correctly, you could develop what we call histamine intolerance. Because it travels throughout your bloodstream, histamine can affect your digestive tract, lungs, skin, brain, and cardiovascular system, leading to a broad range of symptoms that can make it difficult to diagnose the underlying cause. In addition to the histamine made in your body, there is also a mixture of foods that naturally contain histamine, create the release of histamine, or block the enzyme that breaks down histamine, Diamine Oxidase. How do I break down histamine? 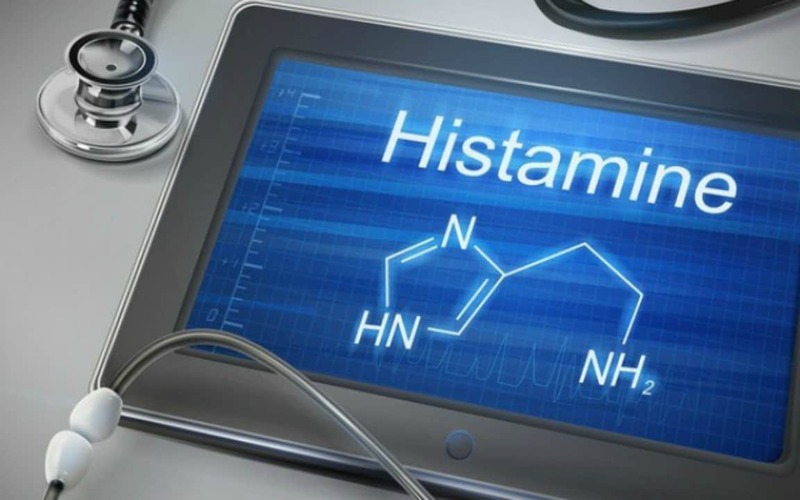 Once made, histamine is either stored or broken down by an enzyme. Histamine in the central nervous system is broken down primarily by histamine N-methyltransferase (HMT) while histamine in the digestive tract is broken down mainly by diamine oxidase (DAO). Though both enzymes play a significant role in histamine break down, the American Society for Clinical Nutrition found that DAO is the primary enzyme responsible for breaking down ingested histamine. So if you’re deficient in DAO, you likely have symptoms of histamine intolerance. Gut Inflammation from Crohn’s, ulcerative colitis, and inflammatory bowel disease. Medications: Non-steroidal anti-inflammatory drugs (ibuprofen, aspirin), Antidepressants (Cymbalta, Effexor, Prozac, Zoloft), Immune modulators (Humira, Enbrel, Plaquenil), Antiarrhythmics including Propranolol, Metoprolol, Cardizem, and Norvasc, Antihistamines including Allegra, Zyrtec, and Benadryl, and Histamine (H2) blockers including Tagamet, Pepcid, and Zantac. Although histamine blockers, a class of acid-reducing drugs, seem like they would prevent histamine intolerance, these medications can deplete DAO levels in your body. Remove the above high histamine foods for 30 days and reintroduce them one at a time. You can ask your doctor to test for histamine and DAO levels. A high ratio of histamine to DAO means that you are ingesting too much histamine and that you don’t have sufficient DAO to break it down. If testing is unavailable to you, you could only try a diet low in histamine and add DAO supplementation at each meal. If your symptoms resolve, you could have reduced DAO. How to Treat Histamine Intolerance? Remove the high histamine foods for 1-3 months. Add in a supplement of DAO by taking two pills at each meal. Most importantly, find the root cause of the histamine intolerance. If you’re on a medication that is causing the intolerance, working, with your physician, to wean off of these medications is essential. The main reasons I see in my practice are SIBO and gluten intolerance, which cause a leaky gut. If you currently have histamine intolerance, you may not have to avoid these foods permanently. It can be a short-term answer until your histamine or DAO levels revert to their optimal ranges. Depending on your personal circumstances, you may discover that you tolerate some foods better than others, so I encourage you to stay positive as you learn priceless information about your body!